Jim Wadsworth. Photo by Randy O. Norfus. Nighttown, the restaurant located at the top of Cedar Hill in the Cedar Fairmount Business District, is as well-known for the music it presents as it is for its fine food. DownBeat magazine, which covers jazz and blues, consistently ranks it among the top jazz clubs in the country, and in 2007 the restaurant won a Cleveland Arts Prize for its shows. The person behind the music that Nighttown presents is Jim Wadsworth, a Cleveland Heights resident who runs Jim Wadsworth Productions. 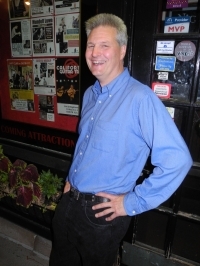 Wadsworth has been booking the shows at Nighttown since June 1999. Born in Kansas City, Mo., he was the youngest of seven children, and he started getting into music during the 1960s. “My sisters would be playing Beatles’ records in their rooms, and I began taking it all in,” he said. Wadsworth played harmonica, piano, guitar and percussion instruments, and he sang in his school choir. When he was 16, his parents sent him to a boarding school in Danville, Calif. While he was there, his family moved to Cleveland. After leaving the boarding school, he enrolled in Kent State University, where he got a degree in general studies, focusing on history, philosophy, sociology and political science. After graduating from Kent, Wadsworth got a job with the Greater Cleveland Growth Association’s Council of Smaller Enterprises (COSE). “I was selling Blue Cross medical insurance plans, and I made sales calls all over Cleveland,” he said. “I really got to know the area.” A year or so later, he joined the Northeast Ohio Jazz Society, and became an active volunteer for the organization, taking tickets at concerts and picking artists up at the airport. He then started doing some public relations work for Peabody’s DownUnder, the club that was located on Old River Road in the Flats. Then, in August 1990, he booked his first show for the club, an appearance by guitarist Hiram Bullock. From that point on, Wadsworth began to focus on music. In 1991, he started booking shows at Rhythms jazz club in Playhouse Square. “There was a restaurant there called Getty’s, and they added this new room so they could present music. Suddenly I had a venue of my own,” he said. Rhythms was sold in 1994, and Wadsworth went back to booking shows at Peabody’s. He then moved on to Wilbert’s on Huron Street and then to the Diamondback Brewery on Prospect Avenue. Finally, in 1999, he hooked up with Nighttown, and the rest is history. His favorite Nighttown shows include appearances by Ahmad Jamal, McCoy Tyner, the Count Basie Orchestra, Hugh Masekela and Chucho Valdés. “There have been at least 100 shows that would be at the top of my list,” he said. Future shows at Nighttown include appearances by the Hot Club of Detroit, who will be there with French singer Cyrille Aimee, on Oct. 11; Italian guitarist Beppe Gambetta, who will be performing on Oct. 16; and Tommy Tune, the Broadway singer, tap dancer, and winner of nine Tony Awards, who will be at Nighttown on Dec. 4 and 5. “We try to be responsive to the community and give them what they want,” Wadsworth said. “And we also like to be an avenue of musical discovery for the people."